Are you prepared for your next career opportunity? September is International Update Your Resume Month, so if your answer to that question is “NO,” there’s no better time like the present to take stock of your career and personal value and set goals for the coming year. Even if you’re not looking for a job, the best place to start is to dust off and update the old resume. That way, you’ll be ready at a moment’s notice when a new opportunity does arise. 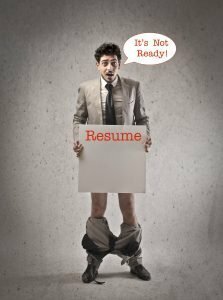 You don’t want to make a potential hiring decision maker wait for you while you scramble to polish up your resume, because it might be too late by the time you’re done. What have you done in your current job that added to “big picture” results? (e.g., making money, saving money, saving time, solving problems). Have you been assigned or volunteered to lead any special projects? Any new awards, honors, or publicity that you earned based on those achievements? Have you gained any new certifications, licenses, or degrees? Have you joined any new professional organizations? What conferences or workshops have you attended this past year? What about the new skills you learned from these certifications and workshops? Have you worked, volunteered, or traveled overseas? Have you learned a new language? Once you’ve answered all these questions, keep a file of all these great new credentials, experiences, and accolades. You’ll want to repeat this process on a regular basis so you don’t go into overwhelm next year. Remember, having these lists handy won’t just help you with your resume update, they’re also critical when it comes to promotions and salary negotiations. Next, take a good, hard look to see if your resume aligns with your current career goals. If you haven’t updated it in a while, you may need to rethink the strategy to position yourself for that next higher-level you’re targeting. Don’t forget to update the rest of your offline career marketing documents and online profiles with the new information. If you find yourself struggling with the whole process, make an investment in yourself and hire a professional resume writer. All your efforts won’t amount to an interview if you have a slapdash resume that doesn’t market your career brand and value effectively.